Many beginning woodworkers and DIYers are understandably confused by the way lumber products are sized. It can lead to considerable confusion if you are expecting a 2 x 4 stud to actually measure 2 inches by 4 inches, or if you expect your 1 x 6 board to actually have those measurements. What you will find is that your 2 x 4 is actually 1 1/2 inches x 3-1/2 inches and that your 1 x 6 board is actually 3/4 inch x 5 1/2 inches. 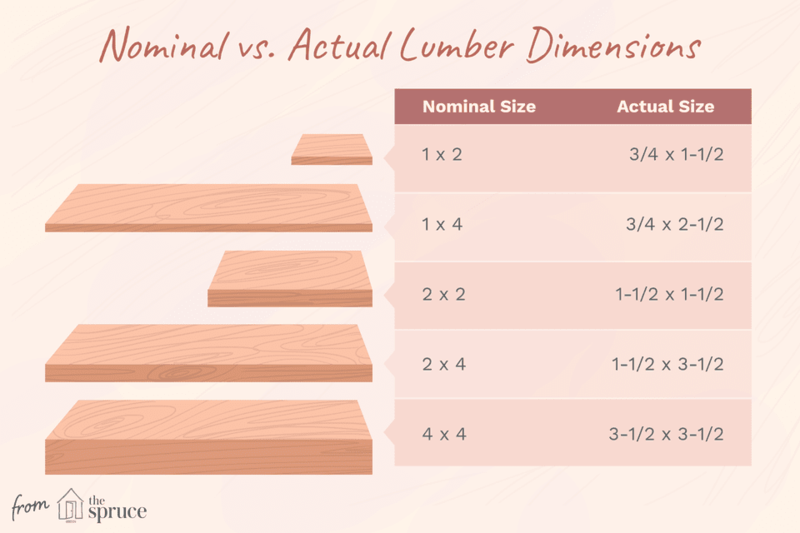 You've just run into the reality of actual lumber sizes as compared to the nominal sizes—the sizes by which they are identified in the store. The measurements by which lumber is sold is virtually never the same as the actual dimensions of the boards when you measure them. So what exactly is going on here? Believe it or not, there actually is some rhyme and reason for why the actual measurements of dimensional lumber don't match their names. Lumber manufacturers typically cut a tree into the various standard types of dimensional lumber very shortly after the tree is felled. At this point, the 2 x 4 is actually 2 inches x 4 inches, a 2 x 10 is actually 2 inches x 10 inches, etc. But then the newly-sawn (but soaking wet) lumber is then kiln-dried until it reaches the desired moisture level. During this process, it shrinks as the moisture in the wood is removed and the wood cells shrink. Once the drying is complete, the boards are then planed to a standard size. Hence, what started out as a 2 x 4 now measures 1 1/2 inches x 3 1/2 inches. These numbers can vary slightly, but modern lumber manufacturers are pretty adept at delivering consistently-sized supplies of dimensional lumber. This is a very different type of measuring wood when compared to the board foot method used in measuring hardwoods. Keep in mind that dimensional softwood lumber that is sold at your home center or hardware store is expected to be used primarily for construction projects rather than fine woodworking pieces. So, a framed wall built using 2 x 6 lumber measures 5 1/2 inches thick, but with a 1/2-inch piece of drywall attached to the wall, it then becomes a 6-inch thick wall. Again, keep in mind that hardwoods and plywoods use entirely different sizing conventions.Once you understand precisely how all these materials are sized, you can design your projects appropriately.